Fr Peter Porteous, Fr Christopher Ross, Fr Myles Lynch and Fr Anthony Rathinam consecrate the Blessed Sacrament during Joondanna Parish’s golden jubilee Mass on 26 August. Photo: Supplied. 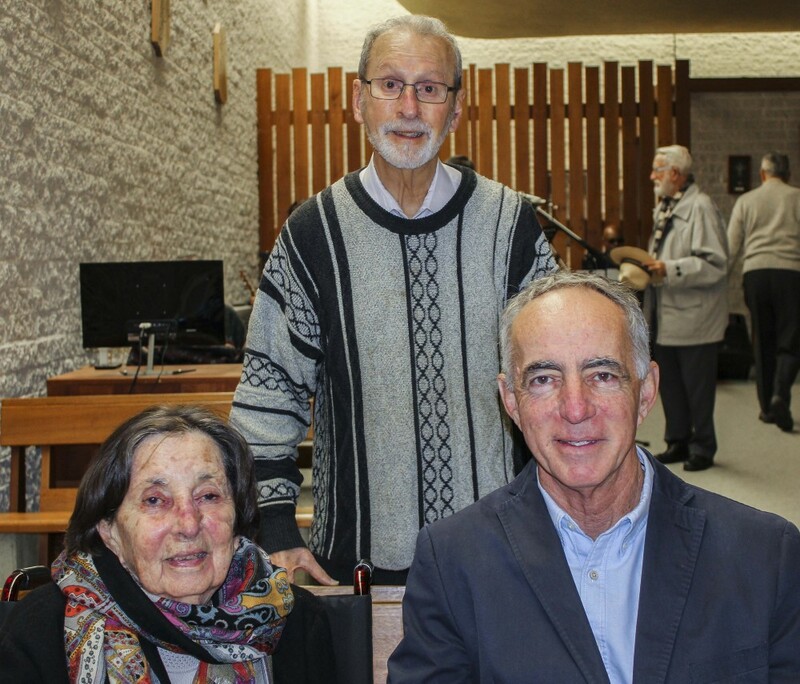 Hymns were sung in different languages to acknowledge the parish’s diversity during a week where the Catholic Church asked its faithful to help vulnerable migrants and refugees to integrate into parish communal life. Fr Christopher Ross OSM was the principal celebrant of the Mass with concelebrants Fr Peter Porteous OSM, Fr Myles Lynch OSM, and current Parish Priest Fr Anthony Xavier Rathinam OSM. Iris Rossen, wife of the late St Denis Church architect Ernest Rossen, at the front entrance of the parish. Photo: Supplied. Joondanna Parish’s inception dates back to August 1952 when Fr Patrick Nolan OSM, an Irish Servite, was transferred from South Africa to initiate a parish in the metropolitan area. Thus, the parish separated from St Kieran Church in Osborne Park to commence the second Perth parish entrusted to the pastoral care of the Servite Friars. When Fr Ross was assigned to replace Fr Nolan in 1964, he identified the need to build a “proper” church for the area’s Catholic community. Designed by architect Ernest Rossen and built in 1967, St Denis Church was consecrated in 1968. Fr Ross, now retired, has been historically been Joondanna Parish Priest on four separate terms. Fr Christopher Ross OSM (standing) with interior designer Iris Rossen and her son Paul. Photo: Supplied. In his homily, on 26 August, Fr Ross highlighted that the ethos of the church is expressed concisely in its doors and the off-form concrete screen that greets the arriving worshippers. 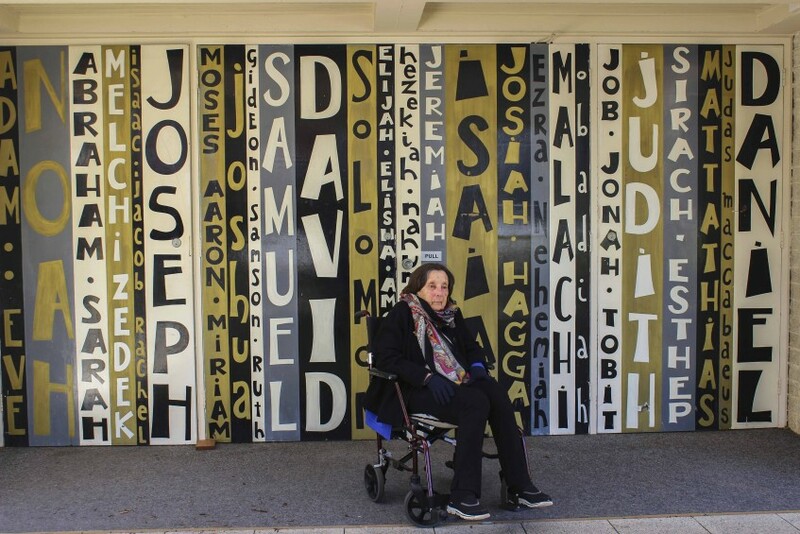 “The great figures of the Old Testament – the ‘People of God’ – anticipate the Christian worshippers who are entering, and immediately they are reminded of why they are there,” he said. 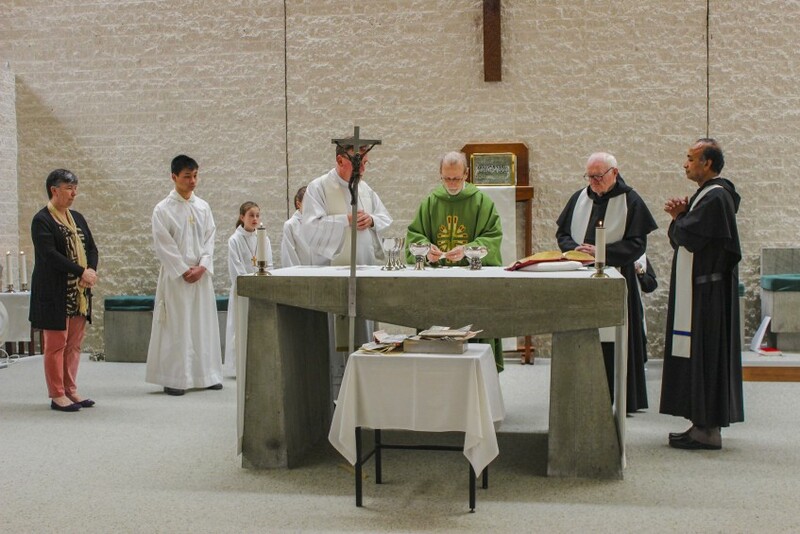 Fr Ross added that each area of liturgical action was clearly demarcated in its proper place: Eucharistic liturgy with altar, chair and lectern; reservation of the Blessed Sacrament; Baptism and Reconciliation. “Almost immediately after its opening, St Denis became a popular place for Sunday evening Mass, especially for the youth,” Fr Ross recalled. 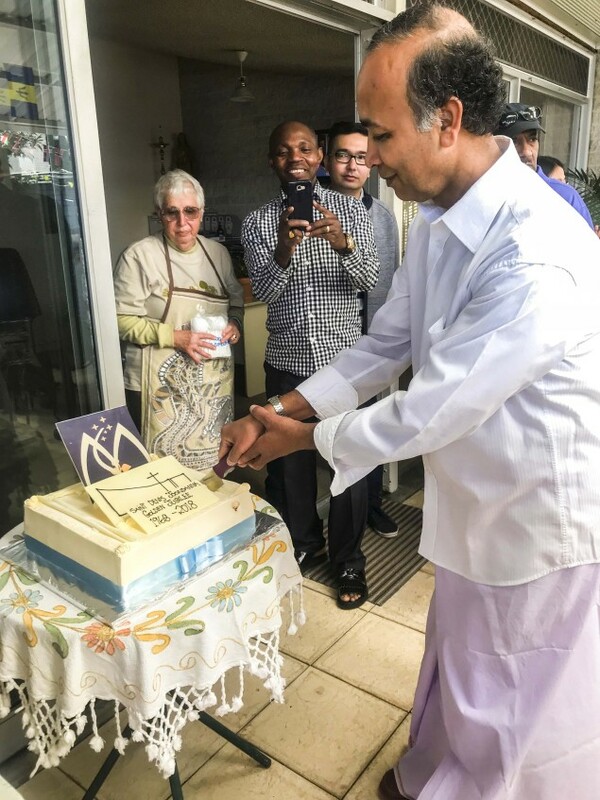 Joondanna Parish Priest Fr Anthony Rathinam OSM cuts the celebratory cake on Sunday 26 August to mark the parish’s 50th year as its community enjoys a multicultural “bring and share” lunch affair. Photo: Supplied. Fr Rathinam has been Joondanna Parish Priest since 1 February of this year. He reminisced the celebrations of 26 August as being “a moment of grace” for all the parishioners. “There was also a fond remembrance of those who had lived in this parish and are now with God, and those who would make up the future church and worship the Lord in this place,” Fr Rathinam said. Fr Rathinam said the standout qualities of the Joondanna Parish community are its generosity and humility. “Plenary Council 2020 has been warmly embraced by the parishioners and it is the hope of everyone that despite the negative coverage in the news media for what has happened in the past the Church will emerge pure and strong in the future. “Placing all our hope on the Word, we listen to the Spirit and await the silent revelation of God,” he concluded. Joondanna Parish is ever-developing. In 2017, a memorial garden was built on the west side between the church and the presbytery.